It only happens twice a year and it's on right now. Enjoy shopping during The A.E.O. Legendary Sale. 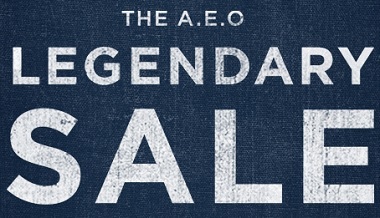 Take an additional 60% off AEO Clearance. Plus, all AEO Jeans: buy one, get the second one with 50% discount. Second item must be of equal or lesser value. Some exclusions may apply. Source of the information is American Eagle Outfitters. Offer ends 01/14/2016. For more details visit your nearest American Eagle Outfitters store.